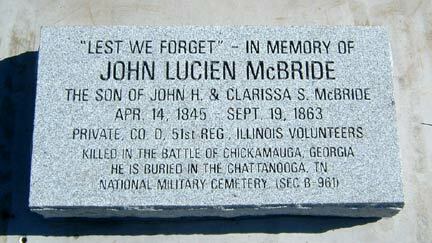 "It will break her heart anyway..."
John Lucien McBride was born on April 14, 1845 in Marion, Ogle County, Illinois to John Holden McBride and Clarissa Snell Patrick McBride. He enlisted in the Illinois Volunteers on March 5, 1862 at the age of 16, where he was a Private in Company D, 51st Regiment. His uncle, D. W. Christian, was also in the same Company. He participated in numerous battles and was eventually killed in the Battle of Chicamauga (oftentimes spelled Chickamauga), Georgia on September 19, 1863, when hit in the forehead by a musket ball (documented in the Chaplain’s letter to John's mother and Uncle's letter to John's parents). A quote from the regiment Chaplain’s letter written to John’s mother after his death: “Our army were obliged to fall back and many of the wounded and dead are in the hands of the rebels and your dear boy among them”. According to historians, before John could be removed from the battlefield, the Confederates recaptured the area where he and several others had been left during the Union Army retreat, and it was not until seven months later, on April 21, 1864, that some men from the 51st Regiment returned to the area where they found the remains of some of their fellow soldiers, including John. They had been buried in shallow graves by the Confederates, and after seven months the rains had begun to expose the bodies. The recovered remains were transported to Chattanooga, TN, where those who could be identified, fortunately including John, were interred in marked graves in the Chattanooga National Cemetery, while those who could not be identified were buried along with thousands of other “unknown” soldiers. John’s gravesite is Plot B 961 (shown in photo at upper left on this page). 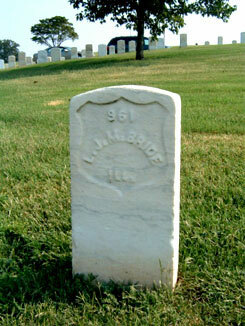 John is listed erroneously in the Chattanooga cemetery records and on his gravestone as L. J. McBride instead of J. L. McBride, but is correctly identified as a Private from Company D, 51st Illinois Regiment. The cemetery has been furnished documentation authenticating his correct initials, which has been placed into the cemetery’s historical files. Family records make no mention of John’s burial location. Given that his burial site was only recently (2007) discovered through an internet search and help from historian Leigh Allen, it is believed that his family was never aware of John’s final resting place. 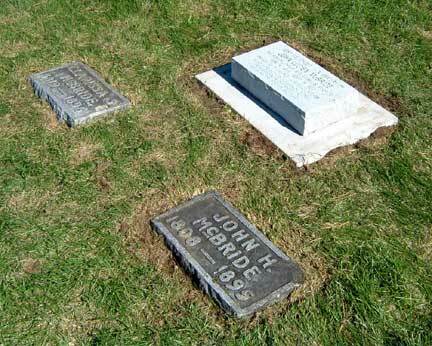 John’s parents moved to the Wabash, Nebraska area in the early 1870’s, where they died in 1895 and 1896. They are buried in the Wabash cemetery along with their daughter Marcia Marie Wood, John Lucien’s sister, who is the great grandmother of Barbara Mohler Maus, Gwendolyn Mohler Farmer, JoAnn Mohler Tuin and Jerry Mohler. Photograph and biographical information, courtesy of Al and Gwen Farmer. John L. McBride Letters, Mohler Family Papers, Lincoln, Nebraska. John McBride, Compiled Service Record, 51st Illinois Infantry, Records of the Adjutant General's Office, 1780's-1917, Record Group 94, National Archives and Records Administration, Washington, D.C.
David Christian, Compiled Service Record, 51st Illinois Infantry, Records of the Adjutant General's Office, 1780's-1917, Record Group 94, National Archives and Records Administration, Washington, D.C.